Of all the venerable hotel bars that this city offers, the one that never really spoke to me was the St. Regis Library Lounge. With an air that screamed lobbyist power broker, it just never provided the quirky elegance that I find essential in a grand old hotel. That changed for me this past autumn when I popped in for a look before the most scrumptious Thanksgiving meal ever (if you have a serious special occasion coming up, go to Adour, it’s incredible). I knew the hotel had been renovated but I assumed it would be more of the same. Wrong. The Bar at the St. Regis (its official name) is soothingly decorated now in shades of violet and grey, adding Art Deco touches like crazy 1960′s biomorphic light fixtures to a 40-seat room dominated by an intensely elaborate Italianate ceiling. Lacquered, metallic, mirrored surfaces abound. It’s simply gorgeous, but not overwhelming. You can easily tuck into a soft corner and broker your deal or impress your date. As for the drinks, they’ve undergone a change too. Sure, there’s the high-end madness one might expect (Remy Martin’s Black Pearl Magnum, anyone? $1,926 – the year the hotel opened – for a two ounce pour out of the only bottle in DC…). 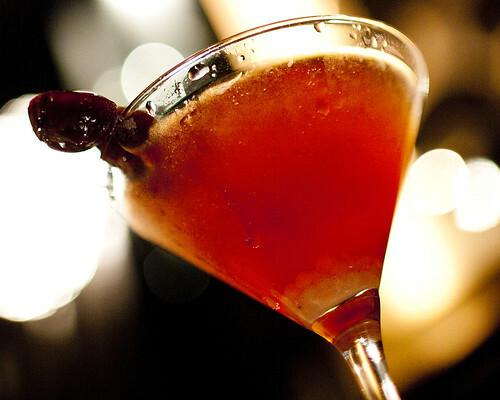 But you can also have a little luxury for less, and enjoy some wacky molecular mixology too! Molecular mixology? Oh yes. 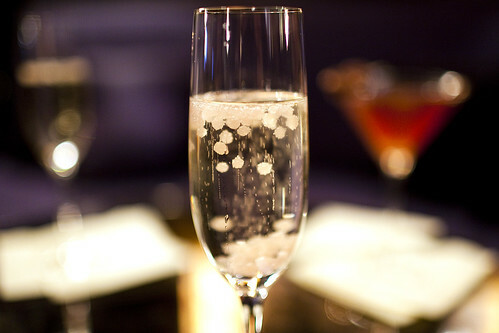 The Bar’s signature cocktail is the Adour Bubbles & Pearls, made with Prosecco and “Cointreau Caviar.” Cointreau has supplied about 20 bars in the country with tool kits that within about an hour processing time transform the liquid into a solid state. Basically, it’s a calcium bath that results in pearl shapes. They can be infused with additional flavors as well. WLDC author Max and I tried this cocktail after admiring the delicate dance of the bubbles and the “pearls” as they floated to the top. “They taste like jelly bellies,” Max quipped, and he’s right – I thought they might burst in your mouth like fish roe, but instead they are completely solid, like tapioca balls. So if you love bubble tea, this is the cocktail for you! It’s frizzy and fun. We also got to preview The Bar’s limited edition cocktail for the Cherry Blossom Festival. It’s called Acai of Spring (Acai = a-sigh) and will be available starting March 30. 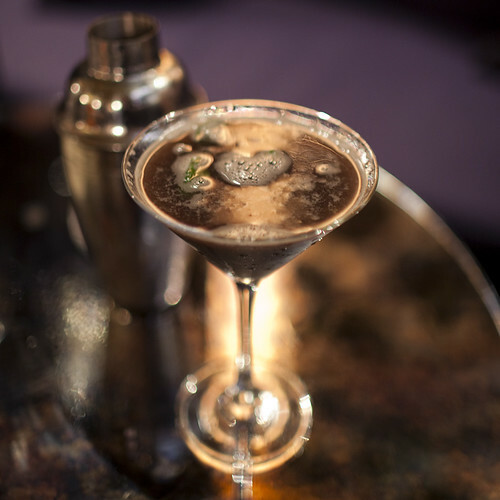 Composed of a vodka and Cointreau base infused with black cherries, spices and acai, the Cointreau Pearls are infused with acai and added here topped by a champagne float. The garnish is sugared black cherries. It’s a very pretty and aromatic drink that made me long for that festival and spring to get started. So who’s responsible for these drinks? It’s mixologist Mia Baila, who moved from Florida to DC in 2008 to join the St. Regis team. 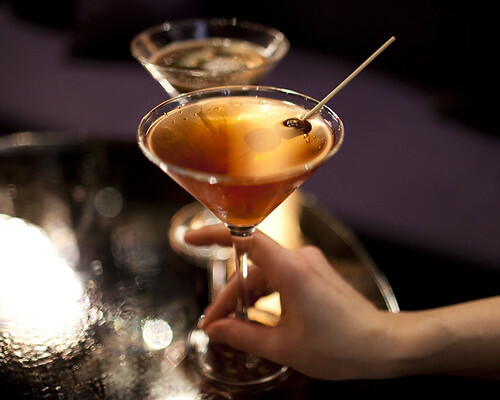 She’s a painter as well, and that artistic background is evident in her drinks style. I’m always interested in finding out what the most popular drink is at any given bar, and here Mia says it’s the Trial by Berry, featuring fresh blackberries, house infused vanilla vodka, fresh lime, spices and a champagne float. “It has the added bonus of being good for you with the berries, and the color is just beautiful,” she said. Mixing drinks that are good for you as well as pretty is Mia’s specialty – as she said, “Drinks can and should be good for you as well as delivering a buzz!” On the spot she rustled up a “greens martini” for me with green superfood powder, fresh pressed apple juice, blueberries, Ketel Citroen and lemon with a champagne float and garnished with mint. It’s not on the menu – she just happened to have some green superfood in her purse – but this off-the-cuff concoction surprisingly did taste good, in a fun childhood way it reminded me of Pez. She’s whipped up wheatgrass cocktails as well! The Bar features its famous Red Snapper Bloody Mary and a variety of the original “good for you” tomato-based drink, so I suppose it’s all part of the same tradition. Cocktails at The Bar at St. Regis are on par with other luxury spots – $16 each (the hotel graciously comped our first round). I can easily see relaxing here with a drink before a dinner date – it’s also definitely one for the parents or a high-end client. Whichever occasion brings you here, Mia is a treasure and will make sure you are well taken care of, with both booze and vitamins in balanced proportion. 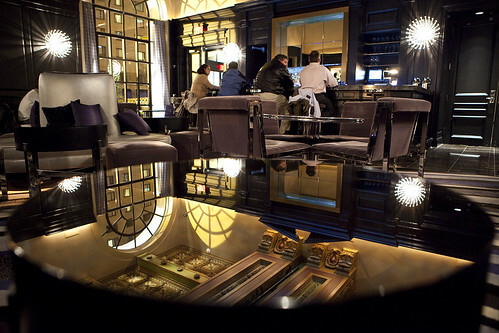 The boyfriend had a solid gin and tonic and I had a fantastic glass of wine at the St. Regis bar recently. Drinks came with a bowls of gourmet nuts (I love when bars do that) and the bartender was great! I forgot about the nuts, Rebecca! Me too, I love it when bars provide snacks gratis. Thanks Chris! I’m getting super spoiled bringing awesome photogs like Max and Samer to review drinks these days. Ohhh I love the St. Regis bar! So glad you had a chance to enjoy it.